k’awat’si Construction is hard at work to maintain momentum on the push to complete Kwa’lilas Hotel. By the end of this week, the canopies over the entrances will be complete. Once another set of materials arrive from Atlas, the crews can start lifting the roof over the main conference room. Cedar siding on the South Building is still being installed, the pool design and Kwa’lilas Hotel’s outdoor signage has been finalized and The new sign will stand 10 feet tall to welcome visitors from near and far. We’re thrilled to see these final pieces being put into action! 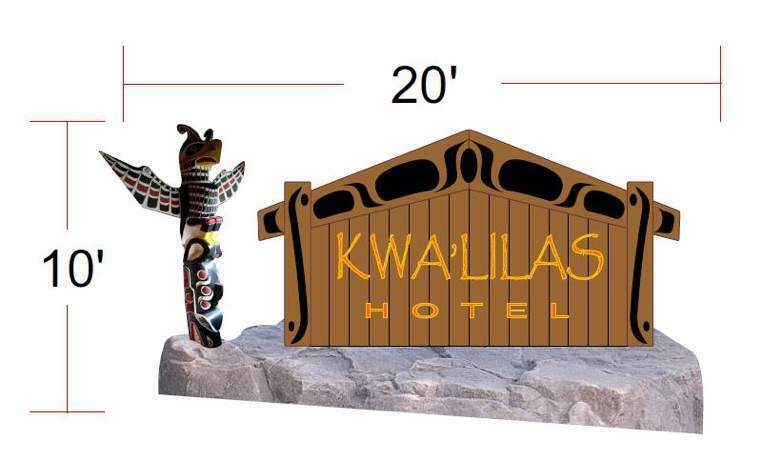 The approved design concept for Kwa’lilas Hotel’s exterior signage. k’awat’si Tour Packages & Website Ready to Go!